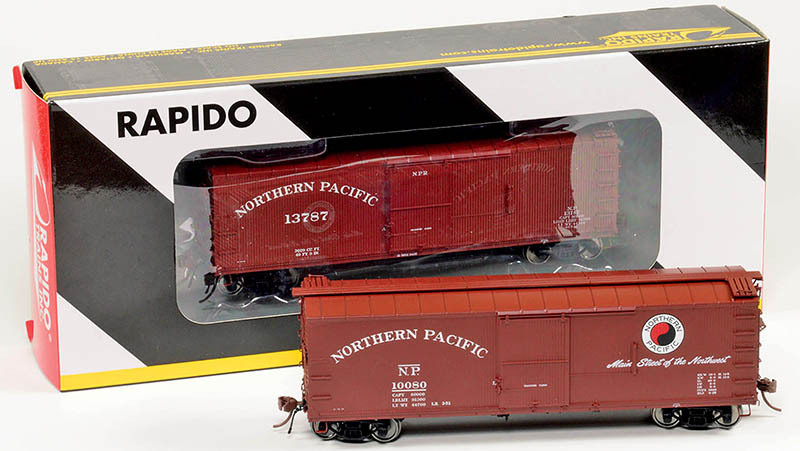 Rapido Trains has recently released its Northern Pacific (NP) 10,000-series, 40-foot double-sheathed boxcar model. 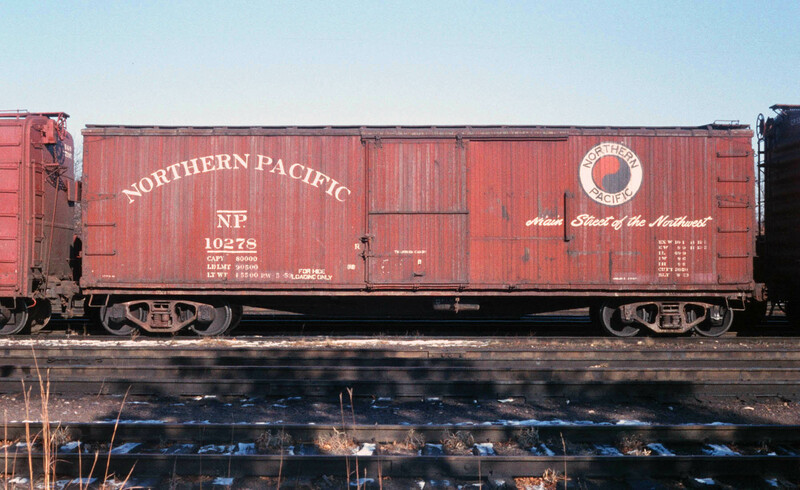 A first not only because this quintessential NP freight car has never before been manufactured in plastic, but this is the Canadian company’s first model of an exclusively U.S.-owned prototype. Numbered from 10000-13999, this series was so large and well maintained for so many years, they are considered by many to be Northern Pacific’s “signature” boxcar. The cars bore Northern Pacific’s radial roof design over a wood-framed, double-sheathed body with sturdy fishbelly underframe. The 4,000 cars built across 24 months, beginning during July 1923, lasted well into the Burlington Northern era, with photo evidence of the cars in company service as late as 1982. Acting on the transportation crisis brought on by World War I, President Woodrow Wilson established the United States Railroad Administration (USRA) on December 28, 1917. In order to reduce the freight car shortage, one of the USRA’s accomplishments was the creation of several standard freight car designs, including a double-sheathed boxcar with a fishbelly steel underframe. The NP never received any of these cars during the war, but instead relied on a modified truss rod design built in its own Brainerd, Minn., shops in 1918. For its 10,000-series fleet, Northern Pacific officials based the boxcar design on a USRA standard plan. These cars were built by several freight car manufacturers. The largest builders were Western Steel Car & Foundry, American Car & Foundry, and General American Car & Foundry. Each builder supplied 1,000 cars. These orders were followed by the Pullman Car & Manufacturing Company and Pacific Car & Foundry, with both builders supplying 500 examples of this boxcar. As delivered, the cars had Bettendorf U-section trucks. Originally, they had K-type brakes with Miner Ideal lever-style handbrakes. Car builders employed Hutchins roofs, which had radial steel sections, giving the boxcars a classic NP-style rounded roof. You’ll fi nd this roof design on many Northern Pacifi c stock cars and refrigerator cars, and on other boxcars of this era. The 4,000-cars used Youngstown Murphy 7/8 ribbed steel ends with a lumber door on the A-end. An additional 500 cars (14000–14499) were built at the company’s Brainerd shops in 1932 following the same design, but used Dreadnaught ends, a new fishbelly underframe, and different brake arrangement. The underframe was painted black to match the trucks; this appearance remained throughout the life of the fl eet. The rest of the car received a coat of Metallic Brown with arched Northern Pacific lettering and centered data on left side of door. At this time there was no Northern Pacific monad herald used on freight cars. As the cars aged, they were repainted as needed, generally matching the current company boxcar paint guidelines. The first change dates to the early 1940s. The small, 36-inch Monad herald was added to the area right of the door and the roof was painted black. In 1945, the railroad began replacing K-brakes with AB-brakes, which took several years to complete. The lever-style handbrakes remained. The paint scheme remained the same, but in addition to the roof, the ends were painted black. Beginning in 1951, the larger 48-inch Northern Pacific Monad herald was used with the “Main Street of the Northwest” marketing slogan written in a script typeface and centered under the Monad. The roof and ends were painted Metallic Brown to match the sides. This is the paint scheme most of the cars remained in until being scrapped. After 1956, the company decided that cars in the series would no longer be repaired or repainted but were disposed of when maintenance was needed. This was also the year more than 300 cars transferred to company service use. This included renumbering to the 200,000 series. The company service cars were common until Burlington Northern purged its maintenance-of-way fleet in 1982. Another use that began in 1956 saw more than 1,000 of these boxcars converted to log flats. Many of those examples lasted until the BN stopped hauling logs in the 1980s. As the cars aged, the interiors became unsuitable for clean loading, and some were assigned to more mundane service like hide loading. Hides contaminated a car’s interior, preventing the car from being used for any other commodity. A “HIDE LOADING ONLY” stencil appeared on the exterior of boxcars in this service. Some of these boxcars remained in use past 1980, maintaining their original 10,000 series road numbers. This is one of the early looks for Rapido Trains’ new HO-scale Northern Pacific boxcar model. This large fleet of NP cars served the road from the 1920s and beyond the road’s 1970 merger into Burlington Northern. Rapido Trains delivered its new HO-scale model with paint schemes used throughout the prototype’s life. The company is marketing the releases as NP Pre-war 1923–1938 with K-brakes, red ends and roof; NP 36-inch Monad 1940–1944 with AB-brakes, red ends and black roof; NP 36-inch Monad 1945–1950 with AB-brakes, black ends and roof; NP 48-inch Monad 1951–1956 with AB-brakes, “Main Street of the Northwest” slogan, red ends and roof; NP 48-inch Monad 1956–1982 with AB-brakes, “Main Street of the Northwest” slogan, red ends and roof, numbered for company service; and an undecorated model. In addition, a car matching the 1951–1956 and 1956–1982 paint scheme, but without a road number, is available directly from the Northern Pacifi c Railway Historical Association (NPRHA). The NPRHA also has a decal set with road numbers for that paint scheme, along with many special markings such as “HIDE LOADING ONLY” stencils. This appearance with Monad herald and “Main Street of the Northwest” slogan reproduces an early 1950s prototype for this 40-foot boxcar. The fully assembled HO-scale model retails for $49.95 and comes in a variety of NP liveries. The model comes well packed in a plastic carriage, enclosed in a windowed cardboard box. The combination ensures that none of the model’s delicate parts are broken in shipping and makes a handsome display on the hobby shop shelf. Included in the box is a single sheet describing the history of the car with a couple sharp photos of the cars in their heyday. There is also a nice shout out to the members of the NPRHA that helped Rapido Trains in making the model possible. Weighing nearly four ounces, having MacDonald-Cartier knuckle couplers, and metal wheels, the car is ready to place on many owners’ layouts as is with no modifications or enhancements necessary. If your operation includes remote uncoupling with a magnet, standard Kadee #5 or #58 couplers are easily swapped out by removing a small self-tapping screw holding each coupler pocket in place. The models are very close to matching the height of a Kadee coupler height gauge. Rapido Trains provides its own MacDonald-Cartier knuckle couplers and accurate 33-inch metal wheels on this NP boxcar model. 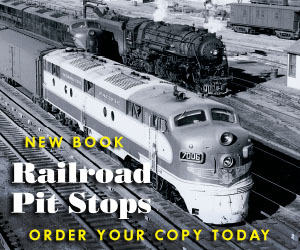 In addition to the offerings cataloged by Rapido Trains, you’ll find exclusive releases available from the Northern Pacific Railway Historical Association. Out of the box, the first thing that stands out is the crispness of the lettering against the Metallic Brown paint. With the help of a magnifying glass, the fine print on the side sills, car ends, doors, and even air reservoir can be easily read, although the latter appears to be upside down on the pre-war models. Each model has a reweigh date appropriate to its paint scheme. The car’s paint closely matches the Metallic Brown sample included in the NPRHA’s Drift Card set. The paint used on these cards was mixed using the original formulas discovered in the historical society’s archive. Also called Mineral Brown or Boxcar Red, the model can appear more red than brown under certain light, which might be why Rapido refers to the cars as having red paint. Rapido Trains frequently promotes its attention to underbody details on its models. This NP boxcar is no exception and faithfully reproduces the early K-style brakes these cars were originally equipped with. The boxcar features the iconic Northern Pacific radial roof with nicely detailed modeled wood running boards including nail heads and accurate bracing. All of the delicate grabs and stirrups, which often get broken off in normal handling, are made of metal. The stirrups are quite remarkable in their fineness and the angle in which they stick out from under the side-sill. The ends are accurately detailed with coupler cut levers, pole pockets, ladders, and grab irons. There is a lumber door and nail board on the A-end, while the B-end has a brakeman’s platform under the lever-style hand brake mounted atop the brake mast. The Youngstown Murphy 7/8 ribbed steel ends appear to match photos of the prototype and include several strategically located rivets. 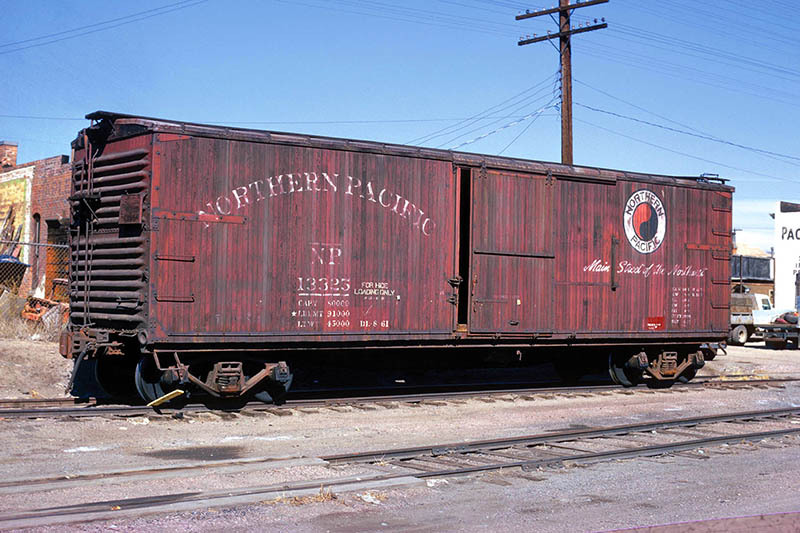 This NP boxcar faithfully reproduces the mdoern AB-style brake rigging applied in later years to these boxcars. A matte black was used on all of the underbody, which has complete brake rigging including a train line and durable air hoses on both ends. The pre-war models have KD-type brake rigging, with the triple valve attached to the brake reservoir. The brake rigging is very finely detailed. New to this model are Rapido’s Bettendorf U-section trucks. The black plastic trucks have great detail and come with Rapido’s own 33-inch, free-rolling, blackened metal wheelsets. The trucks are also attached to the car with self-tapping screws, which have an integrated washer that fits very tightly to the truck. The doors come molded in place to allow the guides and hardware to be accurately modeled. The car body can easily be removed from the underbody. There are four tabs holding the shell and underframe securely together. Sliding a hobby knife between the car sides and underbody quickly releases the tabs without marring or otherwise damaging the model. The steel weight is attached to the model with the same screws used with the trucks. 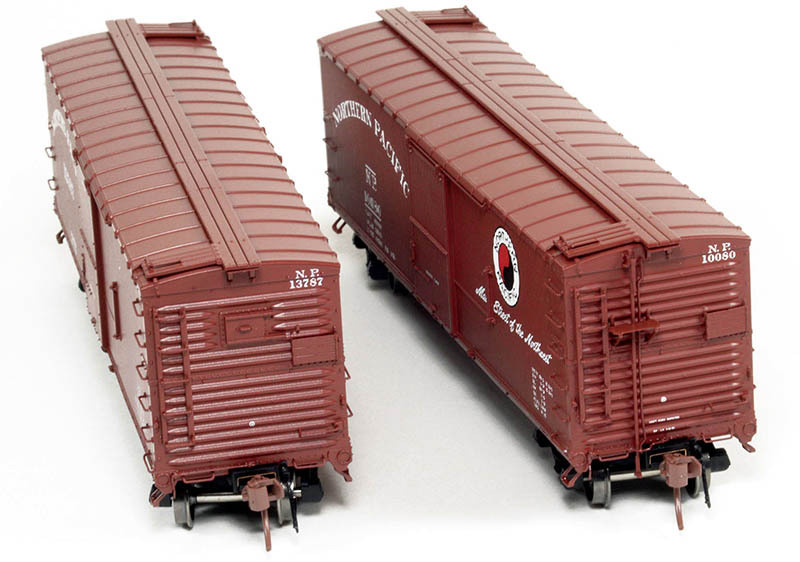 Rapido Trains has certainly built a very accurate, highly detailed, yet robust model of this double-sheathed boxcar. 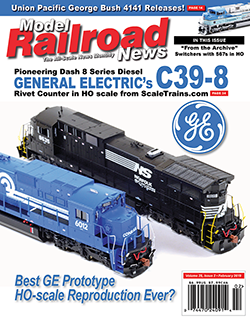 This review appeared in the February 2019 issue of Model Railroad News!